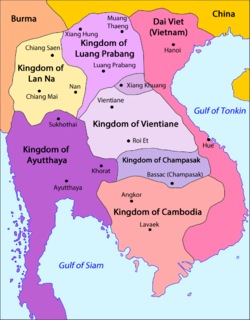 The Kingdom of Luang Phrabang was formed in 1707 as a result of the split of the Kingdom of Lan Xang. When The kingdom split, Muang Phuan became a tributary state of Luang Prabang. Then as the years passed, the monarchy weakened even more, that it was forced to pay tribute at various times to the Burmese and the Siamese. After a particularly destructive attack by the Black Flag Army in 1887, the kingdom chose to accept French protection. From 12 October 1945 Sisavang Vong was officially King of Laos. ^ Thant Myint-U (2006). The River of Lost Footsteps--Histories of Burma. Farrar, Straus and Giroux. pp. 98–99. ISBN 978-0-374-16342-6. ^ a b Tarling, Nicholas. The Cambridge history of South East Asia: From c. 1500 to c. 1800. 1. Cambridge University Press. p. 238. ISBN 978-0-521-66370-0. ISBN 0-521-66370-9. The Phra Bang Buddha, palladium of Lan Xang, the Kingdom of Luang Prabang, and is the namesake of Luang Prabang, Laos. The Phra Bang is regarded as the most sacred and culturally significant Buddha image in Laos. The image is Khmer in origin and cast using an alloy of bronze, gold and silver. This page was last edited on 20 March 2019, at 05:17 (UTC).